With a rich history and the perfect combination of ingredients, the Classic Manhattan Cocktail is as perfect today as it was in years past. This is a grownup drink…proceed with caution! I was sent a couple of gorgeous glasses from my cousin who had split up items from my Aunt Eddie and Aunt Patsy’s estate. Sadly one of them was broken in transit so of course I wanted it more than ever. I could tell the shape of the glass and it was unique so through some research I discovered that it was called a ‘champagne coupe’ and that one of the early uses was for serving Manhattans. The perfect opportunity was at hand to feature this storied cocktail during a ‘Mad Men’ party a group of bloggers decided to throw to commemorate the final season of the television show that starts this coming week. I wanted to make a traditional cocktail of the era and I wanted it in the right glass, doggone it! Nothing else would do for serving this Classic Manhattan! I searched high and low; I went online and found some by Kate Spade, she of the overpriced designer category, and others by Waterford, still overpriced but a name that I would more proudly attribute to my stemware. I finally found the perfect reasonably priced glasses by Libbey (remember, I just wanted them for a couple of photos) but I was not interested in an entire case. Drat!! I was definitely a woman on a mission so I called YaYa’s in the Denver Tech Center, my favorite restaurant, hoping they had some on their shelves that I could borrow. Turns out the manager did one better! When I talked to Scott, he said they didn’t have any in the restaurant but he thought he had some at home packed away. Scott offered to check and let me know. The following morning his email was like a gift, he had found his cache and would drop off a package at YaYa’s for me to pickup. Tell me, how many restaurant managers will do that for you? YaYa’s will always fix mussels the way I like them no matter what the current menu offering is and I love them for that but this was over and beyond. Many thanks Scott. What? I can keep the glasses too? All FOUR of them? I already thought you the best and now my readers know why…I LOVE these glasses! 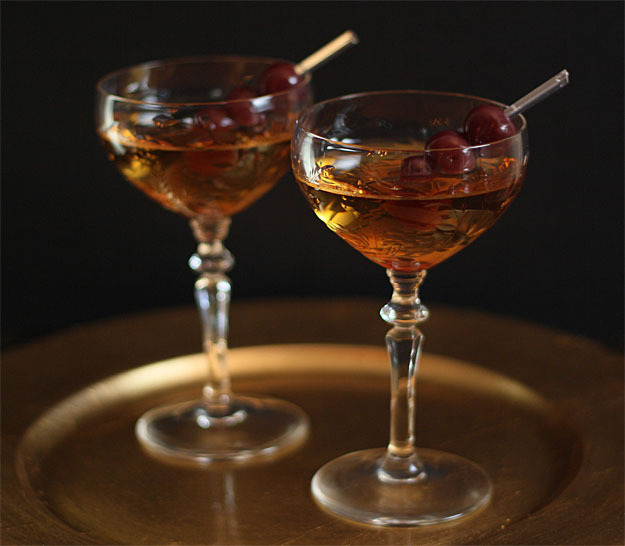 The Manhattan is an elegant cocktail with a rich history; some of it fabricated to lend more glory to its name but all leading to it originating in Manhattan, one of the five Burroughs of New York City. By all accounts it originated in the later part of the 19th century and has seen a resurgence often attributed to the popularity of ‘Mad Men‘ – a television show that chronicled the lives and social mores of the 1960′s in America. I’ll be honest. I didn’t expect to be a fan. Let’s just say that my parents both enjoyed a Manhattan. They were a part of that 60′s generation that drank too much and partied too hard; there were affairs and a divorce and in a real soap opera twist; a re-marriage. By them. To each other. Watching that play out on the small screen hit a bit too close to home so I kept my distance from the show for the first couple of years until a friend insisted I do a marathon with her and doggone it; I was hooked. Truth is I had also kept my distance from a Manhattan all these many years for many of the same reasons and that was another error in judgement on my part. This is no lightweight drink. Recognizing that my taste in wine has segued from Boone’s Farm to a nice Cabernet over the years, I’m quite certain that if someone had introduced me to this cocktail those many years ago; it would have been received less than favorably. 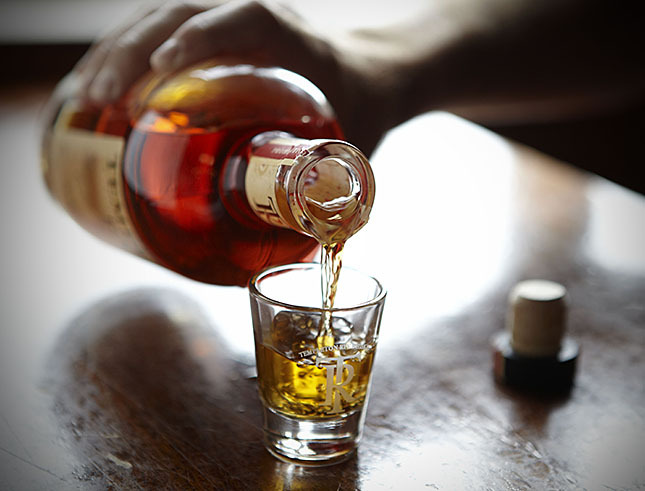 This is booze, pure and simple. Despite some controversy over where it began, one area without controversy is the continued popularity of the drink. It is still considered one of the finest cocktails ever conceived and on every bar’s list of best cocktails. Purists (who are these people anyhow?!!) presume that the only way to create a Manhattan is with Rye Whiskey, Sweet Vermouth and Bitters but there are those who cry sacrilege if not using Dry Vermouth. Most concede that Rye Whiskey is the liquor of choice and I love Templeton Rye but bartender choices run the gamut from Bourbon to Rye to Canadian Whiskey. For me it has to be Rye but I’m more forgiving with the Vermouth depending on tastes, personally preferring Sweet Vermouth. Bitters are seeing a huge boon in popularity right now and the choices are endless but this is a Manhattan and Angostura bitters are a must. Sometimes something is so good that you simply don’t mess with that success! When I originally posted about this cocktail; it was in conjunction with a bunch of blogging friends who were verklempt over the ending of the Mad Men television series. While this reboot had me clean up some of the focus on that event from a couple of years ago; I would be remiss to remove these recipes…a great collection of food and drink from that era. With a little twist but great tasting recipe! This sounds amazing! Thanks for sharing. This mad men drink goes down nice and smooth. Thanks for sharing ! Those glasses are gorgeous. 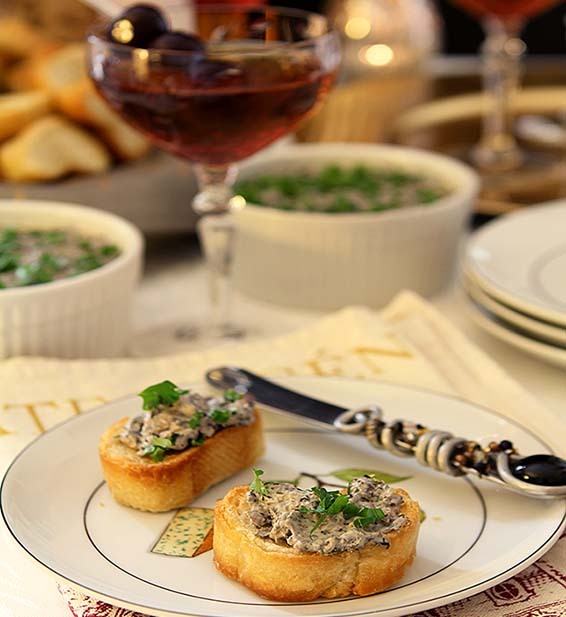 The mushroom pate recipe sounds delicious! I think I could actually get my mushroom-hating husband to eat this since the texture is changed. I had a comment on the dish that one guy’s wife loved the pate and she doesn’t like mushrooms. There is hope! Believe it or not but I have wanted to make mushroom pâté since I first saw a recipe for it in Vegetarian Epicure. I love the way yours looks and I might just finally make it!! That martini glass is really gorgeous! I love those glasses and I have to say I got a bit sniffly at the thought of your aunts’ glass getting broken. Then when Scott said he’d look, I was feeling better. Then when he found them I was even better. But… when he said you could have them AND I saw the photos, I got sniffly again. So often we focus on the few bad things in the world and forget about so many good people. I make a good mushroom pate but my goodness, mine isn’t as good as this. Once I looked at the ingredients list, I knew yours was better and I must have it. He made me sniffly too; I am a total sucker for those unexpected acts of kindness, of being reminded of the goodness of people that is so often hidden behind the constant news of the bad ones. A reader left a comment that his wife loved it and she doesn’t like mushrooms so bet you would love it! Wow, Scott is definitely a great friend to have! Wish I’d known you were having a Mad Men party! I participated in a virtual one with the author of The Unofficial Mad Men Cookbook and had a few friends over last night to watch Sunday’s episode again. Everyone contributed popular appetizers from the ’60s and I mixed Don Draper’s go-to cocktail – the Old Fashioned. Your Manhattans look fabulous! Cheers, Barb! You would sure have been a perfect fit! I wanted to do the old fashioned but someone else had tagged it and I had already posted one not that long ago. The Manhattan was sure tasty but it’s definiitely a ‘big girl’ drink! Cheers back at ya! My wife doesn’t usually like mushrooms but she liked this pate. Maybe it was the manhattan! I have to say, I’m normally a purist about things, but since I started making bitters a few years ago, I’m always excited to try new varieties and use them when I can in cocktails. Admittedly, though, I think the bitters boom is a little out of control at the moment; there’s a tiny corner store in my (admittedly kind of hipster) neighborhood that sells organic produce and has an entire shelf dedicated to different kinds of bitters. I guess they know their audience! Anyway, I love Manhattans; your glasses are gorgeous! I need to bookmark this mushroom pate too! I’ve done some homemade bitters too Kelly and I agree with you wholeheartedly about the out of control; fads tend to do that don’t they? I get asked all the time to feature a specialty cocktail from some major ‘mixologist’ and the ingredients often include bitters I’ve never heard of. I won’t do those for the blog; I want to create a cocktail or share classics that people can actually make in their home! Still, for this Manhattan; I know Don’s drink would have included Angostura! Whatever or however; yes the pate is worth making! I love this post! I always want to know the history behind everything, so this was great, and both the cocktail and pate look amazing. I recently tracked down my own pair of coupe glasses at an antique store after admiring the way Betty sips her gimlets. As a semi-veggie (fish, no meat), I LOVE the mushrooms, too. Happy Made Men viewing on Sunday! man, that manager is the nicest!!!! I want that mushroom pate. Sounds so yummy! Love this blog party! I love your glasses, too. This pate and the drink are must makes for me. Love all the characters, really, in their own way they are great but gotta say Peggy, I guess. Thanks Mary and I love them too. I would love them without their reminder of someone’s generosity but that sure does add to the value for me! Hope you do try them; thanks for stopping by. The last time I tried to order an Old Fashioned, they said they couldn’t make one and offered me a Manhattan instead. Not knowing the difference between the two, I accepted–and was nearly knocked over by that **this is all liquor** feeling. My dad, who was at the same event, told me that’s what you order when you’re trying to do some serious drinking. Ha! Still, they have their moments. I love your story of how you acquired the glasses for this photo shoot! You have a great relationship at that restaurant! I like chicken livers cooked with stock for a long time and used in a gravy at Thanksgiving but even then I have to make a separate batch for everyone else so I don’t think you are alone…and I sort of figured as much. Besides, this is REALLY good. Any leftovers? I put it in an omelet. OH MY GOOD! Champagne coupes are pretty, aren’t they? I think (though I’m not positive) they were also the original martini glasses (before the v-shaped “martini” glass evolved). The Manhattan is one of my favorite drinks. I prefer a 2:1 ratio, but your 4:1 ratio is also quite nice. Sweet vermouth for me, although sometimes I like a Perfect Manhattan — half sweet vermouth, half dry. Good post — thanks. He is such a nice guy Gwen but this was unexpected and truly a sweet gesture. The pate is divine and if you’re interested in trying some bourbon/whiskey cocktails let me know; I would probably suggest something a bit more lightweight to start. I have a friend who has often said, ‘I hate bourbon’ and then I’ll make her a great bourbon cocktail and she’s can’t believe she likes it! I love Manhattans! Such a classic, tasty drink and mushroom pate. Yum! I want to come hang out, nosh and sip with you with these two fantastic recipes. As for my favorite Mad Men character … Shh … I’ve actually NEVER watched! Gasp! It’s been in my Netflix queue for quite some time. I just have very little time for television. But one of these days I truly do want to start watching it. This pairing is just perfect!! Thanks Claire; it really is! Trying it all out on a Wednesday night? Decadent too! My grandmother asked for a Manhattan with Southern Comfort a few years ago for her birthday, so I did some research on the internet and bought the appropriate ingredients. She enjoyed the drink – maybe a bit too much. The family still gives me a hard time for getting her tipsy with one drink! Real life out loud chuckle; thanks for sharing Angela! What a gorgeous cocktail and delicious pate recipe. Those glasses are stunning. I can’t wait to make this boozy beverage. Pinned. Thanks Jennie; the glasses are so precious I’m nervous using them but hey, they do me no good in a chine hutch!